We believe local news should be real news. an unbiased manner. Right now, we can't be confident this is happening on Channel 10.
Who is Sinclair Broadcast Group? How are they affecting the news? 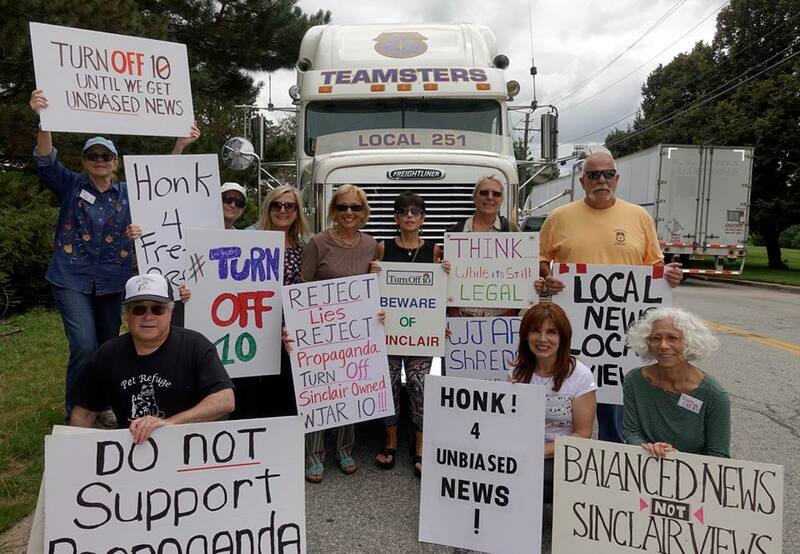 The Maryland-based company is the nation’s largest owner of TV stations, with 173 in 81 cities nationwide.​ This disproportionate ownership of local TV news stations puts accurate news reporting at risk as Sinclair is known as a purveyor of 'fake news'. Learn more. Thanks to efforts from groups like ours, and the outcry in national media, Sinclair Broadcast Group was unable to purchase even more stations from Tribune Media. This would have given Sinclair control over 70% of local TV stations in the entire U.S. Tribune withdrew from the sale after the FCC (which had been thought to be favorable to Sinclair) said Sinclair's tactics in meeting federal divestiture requirements were fraudulent. They are suing Sinclair for $1 billion for breach of promise. Learn more here. There's a reason why Sinclair stations are called "Trump TV". Stations are forced to carry right wing commentaries which bias perception of actual news. The people doing the commentaries work directly for Sinclair and take advantage of the packaging of the trusted local newsperson. “Sinclair is exploiting that credibility or trust that people have invested in their local stations by injecting a political message into it,” warns David Zurawik, the Baltimore Sun‘s veteran TV critic and a close company watcher. Check out the many reports about Sinclair on respected media. You can fight back, here's how. For starters, Turn Off 10. Don't watch the station. Television stations calculate the rates they can charge advertisers based on the number of viewers they have. The fewer viewers, the less money the station can make. So, let's hit them in the pocketbook. If their audience shrinks, the station, and Sinclair, will take notice. Want to do even more? Here's a list of advertisers for Channel 10. (Follow the link and scroll down on the page to see them.) If we boycott the advertisers, they will put pressure on the station to change. See our Facebook page for current actions.